Ultralight cooking kits for multi-day and S240/Overnighter experiences. What I’ve learned has been through my experiences and from the folks in the ultralight backpacking world. Backpacking Light is just the tip of the iceberg in this respect. From BPL there is an endless stream of resources. This spoon comes as part of a fork & spoon kit. You may be tempted to buy a spork, but do yourself a favor and don’t…you will ultimately find it does neither well. I use a clear lighter so I can see fuel levels. Bic also makes mini lighters that are more compact and lighter. I carry a handful of matches in my ER kit for backup…always, always carry more than one way to start a fire. simple cotton, good for cleaning up and using for other needs in/around camp and on the trail. I made one modification to my SP700 that’s worth noting. The mug lid comes with a feature to hang it on the side of the pot. While it is clever, I ultimately found this feature useless and it snagged the side of the mesh stuff sack when unpacking. I cut it off, ground, then polished the affected area to finish it. I then drilled two holes in the center of the lid and used some paracord as a lid handle. SP700 on a penny stove using two titanium stakes and the windscreen for pot support. I consider this kit luxury as a result of one item in my kit. There is nothing better than sitting in the woods, leaning against a tree, drinking coffee or a cup of tea from this, my SP450 double wall mug. Without the double wall mug, this kit weighs in at 255g/9oz. Now this kit is great! It’s light, flexible, and durable. However, to purchase this kit, costs well over 100US dollars. Heineken Pot on a P.P.S. The lid is removeable via the yellow cord. The top is cut just below the rolled rim. Many users of this pot will insulate with cotton cord, and/or silicon for handling and drinking from the pot. I’ll get to that at some point. All contents of this kit fit inside of the Ziploc storage container, which protects it during transport. The pot fits upside down; lid, stove, lighter, and bandana go in the pot while the windscreen fits between the pot and container. The storage container can also be used as a mug or bowl. This kit is affordable, accessible, and a full 50g lighter than my luxury kit! You just have to like Heineken, or be willing to dump it out. Alcohol stoves can use two types of fuel Methyl and Ethyl Alcohol. Before you use either of these I suggest you read up on the types of alcohol and potential hazards of handling and burning them. Zen Stoves has some great information regarding where to find them and what the risks are. This is not meant to deter you from using alcohol stoves. It is meant to encourage you to read and understand the tools you are using. I sound like Norm Abrams. I’ve used both types of alcohol, but I prefer Ethyl. Ethyl alcohol is found at nearly all hardware stores, packaged as denatured alcohol. It is also found in several other products including the beer in the Heineken can and the hand cleaners found in nearly all public spaces these days. However, to be used as a fuel the product must have Ethyl alcohol near the 90% range or above. My stoves use somewhere between 1-2oz. of fuel per burn. 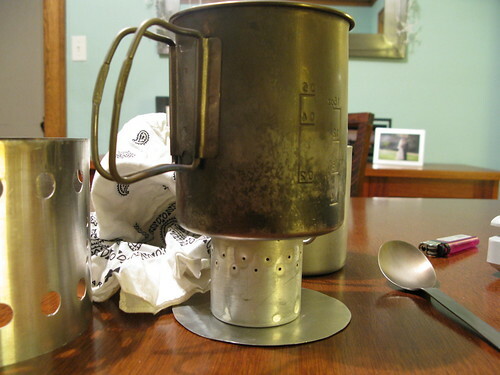 Depending on the length of a trip, opportunities for resupply, meals planned, and stove fuel consumption the amount of fuel needed can be determined. Typically I carry 4-8oz. of fuel in a Nalgene squeeze bottle. Nalgene squeeze bottle with 8oz. of fuel. You can also find your own storage solution for fuel. 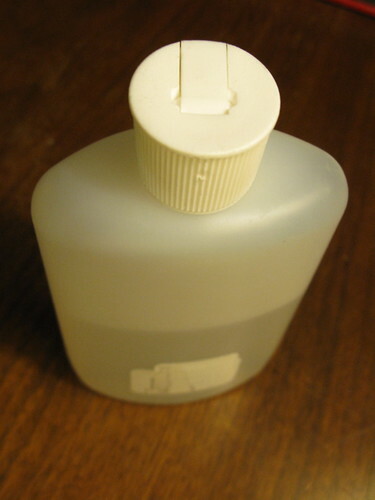 An empty water, soda, or juice container, a used shampoo bottle, etc… All of these will work. Just make sure you won’t confuse it with your water supply. So there you have it a luxury, go out and buy it kit and an ultralight, go out there and make it kit. Both are fully functional and both are elegant in their own way. The beauty of these two kits for bikepacking is that they are self contained. Everything fits in either the SP700 pot, or the Ziploc container, protecting it from bouncing around in your pack and keeping it quickly accesible. Good post Joe. Let me ask you something. I’ve made many of the same stove/pot systems. 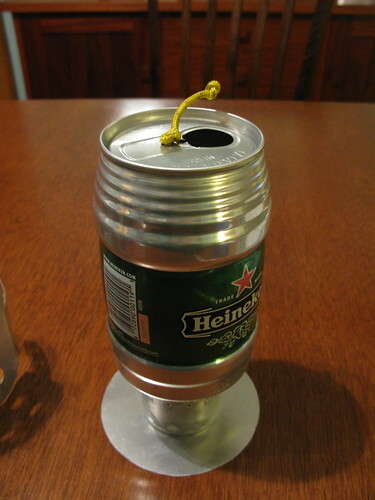 The only one I never got around to making and trying was a Heinekan keg can pot. Do you find it to unstable? That was a big issue for me with the cat can stove, it was pretty unstable with most anything on it. 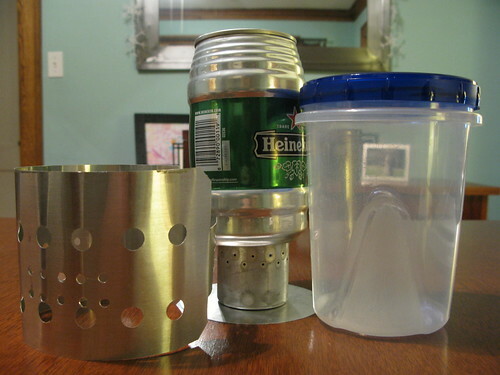 I’m a fan of the SP pot… but I just can’t bring myself to repeatedly heat a Heini (or any drink) canister. What coatings to they use? Do they leach into food / water? What else burns off the can with every cook? 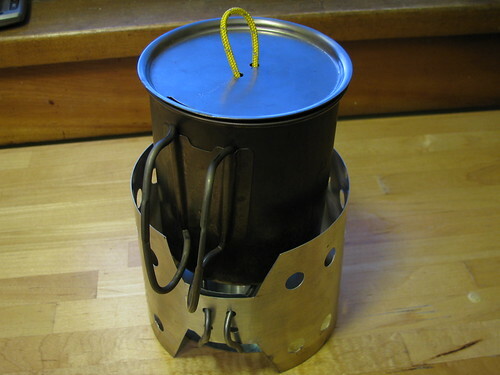 I have several MYOG ‘White Box’ stove variants, along with a Starfire and other wicked designs. I’ve settled on a Trangia though… simple, reliable. Bicycle spoke tripod for holding my pot. Al. flashing windscreen or home made potstand cone configuration. As a newb, and trying to do a lot of DIY, the leaching has me concerned as well. Anyone have an absolute answer on the Keg Can? I’ve seen people argue both ways on the backpacking sites. This is the first time I’ve used a Heineken pot and I haven’t used it much at all. I honestly don’t see a ton of value in it, other than going affordable to jump in. I’ll use it this spring I’m sure, but I much rather prefer the ti kit for durability and usability. I am using the SnowPeak cookset (pot and small frying pan) together with a pepsicanstove and it works like a charm. Half litre sodabottle is more than enough fuel for several days of warm tea in the morning and dinner in the evening. DIY stove is great but a DIY pot is a bit too far for me. I ve seen the wierd smoke that comes from melting cans so I prefer to cook in a dedicated pot. 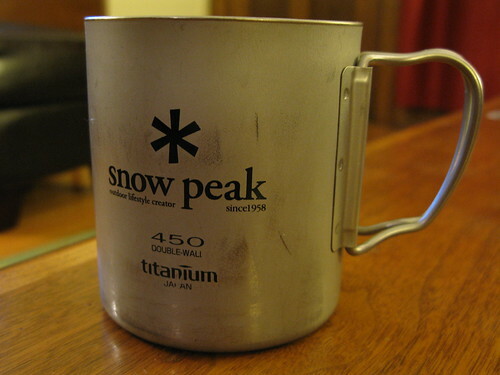 The snowpeak stuff isn’t too expensive compared to MSR et al. At least in the Netherlands it’s a bit more affordable. Your windscreen with potstand looks very nifty. It that premade or selfmade? At the moment I use a esbitholder as a potstand but that’s pretty heavy. I have a Zelph Stoveworks ‘Cobalt” beer bottle stove. I think he actually has improved on the design since then with newer versions of these. In fact, that whole forum is filled with a lot more info than can imagine about the relative benefits, etc. of one type of stove over another. If your state allows it, buying 190 proof (95%) alcohol works really well. It burns without smoking and is easy to light. Common brand is Everclear, but I’ve found other brands.